We’ve talked a lot about PrinterLogic’s capabilities when it comes to network printer management, and how it provides you with a centralized web-based admin portal that’s both feature-rich and incredibly easy to use. But did you know that PrinterLogic also offers the same level of simplicity and efficiency when it comes to managing printer drivers? Plenty of our customers already do, as indicated by a recent survey from the independent research firm TechValidate. 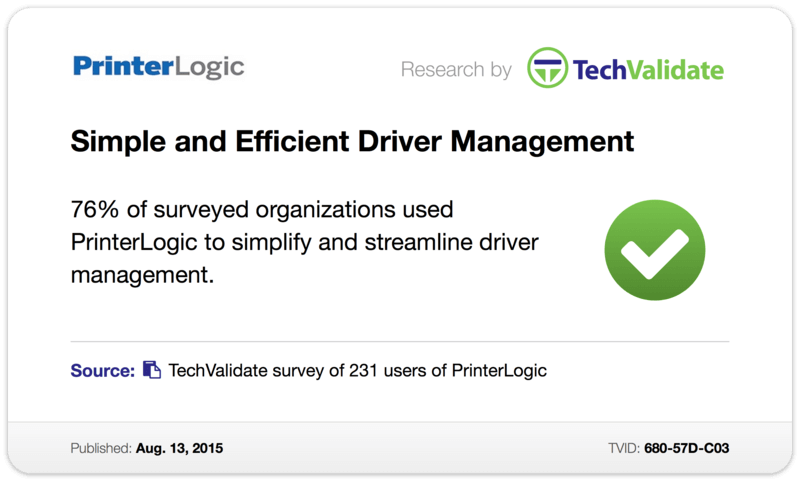 That survey found that 76% of the respondent organizations used PrinterLogic to simplify and streamline their printer driver management. Those respondents weren’t a uniform group. They came from every sector: government, real estate, education, transportation, manufacturing, nonprofit, construction, banking, and healthcare—to name only a few. They also ranged in size from small businesses to large enterprises, including members of the Global 500, the Fortune 500 and the S&P; 500. In each case, PrinterLogic enabled these organizations—regardless of their size, regardless of their expertise—to regain control not only of their network printer hardware but also the software required to interface with that hardware. Historically, drivers have been one of the most problematic aspects of keeping an enterprise print environment running smoothly. But PrinterLogic changes all that. Its streamlined printer driver management gives you centralized management of all your printer drivers in a single repository. From this console, you can push out driver updates to printers on end-user workstations with ease. You can choose to do so selectively, or you can even schedule mass updates to take place automatically outside of business hours. PrinterLogic also avoids the classic issues of incompatibility. Its universal support means that it works with all printer drivers, from manufacturer-supplied to custom-coded. And because PrinterLogic isn’t partial to any one platform, managing printer drivers is an uncomplicated process in Windows, Mac, Linux or hybrid environments. The same goes for virtualization solutions such as Citrix, VMware or VDI. PrinterLogic’s seamless printer driver management means that all drivers are automatically managed and updated on Citrix servers and VMware or VDI virtual machines you might have throughout your organization. Maintaining and updating drivers is one thing. PrinterLogic, as all those satisfied customers can attest, actually goes one step further by giving you fine-grained, expert-level control over every aspect of your organization’s drivers. Use it to quickly access detailed profile configurations and adjust parameters like print resolution, duplexing, paper size, paper source—any setting that the printer supports, as a matter of fact. Then you can choose to apply these custom profile configurations during the initial printer install, each time a user logs on, or even after the completion of a print job. Printer driver management isn’t the only way PrinterLogic improves day-to-day handling of drivers, either. It integrates with your current WAN caching technologies to conserve bandwidth by avoiding cross-WAN driver downloads. So it ends up saving IT resources in every possible area. It’s safe to say that many of those organizations first deployed PrinterLogic exclusively as a robust print management solution. Those impressive TechValidate numbers show how many of them are now enjoying its manifold benefits as a printer driver management solution too.